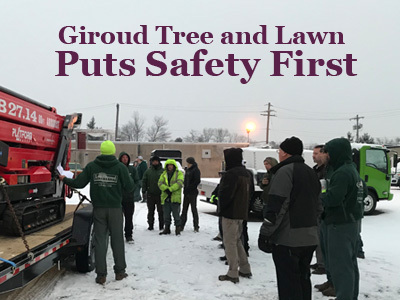 Giroud Tree and Lawn Makes Safety a Top Priority- Always! It’s 7am on a frigid January morning. The Giroud Tree crew is gathered outside, clutching their cups of hot coffee and breathing out icy puffs of chilly winter air. It may seem like an inopportune time and place for a meeting, but the presentation they’re watching can’t wait for warmer weather. Giroud General Treework and Safety Manager, Doug Muth, along with Crew Leader and Equipment Advisor, Dan Rombold, are hosting an important information session about the newest addition to the fleet- an 89 foot Backyard Bucket. Giroud Tree and Lawn Makes Safety a Top Priority- Always. Safely doing complex treework and operating big equipment like this doesn’t just happen, which is why Girould Tree and Lawn launched it’s Safety Committee in 2012. Giroud understands the importance of building a strong culture of safety throughout the company. One of only a few PA Certified Safety Committees, Giroud’s Committee has passed and continues to meet Pennsylvania’s strict requirements to keep our employees safe and injury free. 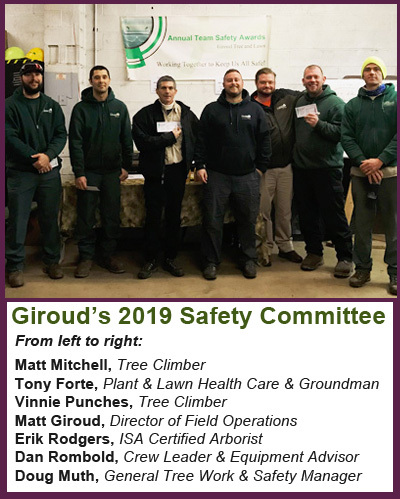 Representing every area that impacts the safety of our crews and your property, the 2019 committee members are: Doug Muth (General Tree Work & Safety Manager), Matt Giroud (Director of Field Operations), Matt Mitchell (Tree Climber), Vinnie Punches (Tree Climber), Tony Forte (Plant and Lawn Health Care & Tree Crew Groundman) and Erik Rodgers (ISA Certified Arborist). Also pictured with the committee is Dan Rombold, Crew Leader and Equipment Advisor. 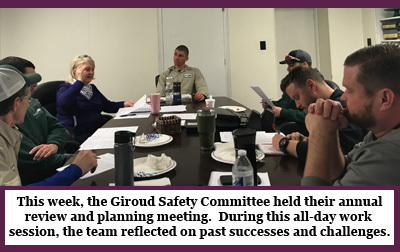 This week, the Giroud Safety Committee held their annual training and planning meeting. During this all-day work session, the team reflected on past successes and challenges. That proactive approach is key. The committee actively works to ensure everyone feels comfortable reporting all incidents. This upcoming year, they plan to appoint a peer correspondent to act as liaison between the field crew and management teams. They’ll also be working with the crew on conflict resolution tactics and how to discuss incidents in an open and judgement-free environment. Over the last few years, the committee launched several initiatives to improve training and education on how to operate safely. Along with the Annual Winter Training Day and the Summer Training Day, several smaller training programs have been scheduled throughout the year. The Mentorship Program will be relaunched for better skills training and efficiency in the field. Weekly Tailgate Tuesday sessions offer a unique opportunity for the entire crew and arborists to discuss hot topics and challenges. Tree care can be hard work. Our crews often deal with challenging jobs that other companies are unable to do. That’s when you’ll see our focus on safety in action. Crew members are in constant communication; working together to keep each other and your property safe, even in the toughest situations. When You Buy from a Company that Invests in It’s Employees, Everybody Wins. You’ll Love Doing Business with Giroud… Guaranteed! This is just the tip of the iceberg when it comes to everything that has been accomplished in the 7 years since the Giroud Safety Committee was formed, and they don’t plan on stopping there! This year’s focus is on Leadership, Community & Skills Development. Goals have been set to empower all crew leaders with the communication skills they need to continue a team building atmosphere. They are also working with each employee to set individual goals and make certification programs available to match these goals. It’s going to be an exciting year for the Giroud Team! Want to see the crew in action first hand? Call today for a FREE property inspection! Giroud Tree and Lawn Makes Safety a Top Priority- Always! Overall rating:	4.8 out of 5 based on 2621 reviews.